Rawan Arraf : There is something troubling about the recent five-day trip to Australia by Israel’s Prime Minister Benjamin Netanyahu, something beyond the charade of pomp, bravado and contrived pleasantries. The trip itself was heralded as historic, firstly because it was the first visit of a prime minister of Israel to Australia. The agenda was primarily related to trade negotiations, and more significant issues relating to Israel’s occupation were left off the official agenda. What is troubling is the Australian government’s apparent willingness to collaborate with Netanyahu’s plans, including – just as the United States President Donald Trump appeared to have done – engaging in Netanyahu’s fantasy version of a “Palestinian state”, which in essence is a form of limited occupation with de facto apartheid conditions, or “occupation lite”. The troubling part is that the Australian position, which has shifted to the right since 2013, is flirting more intensely with this fantasy and, at the same time, encourages Israel’s breaches of international law. 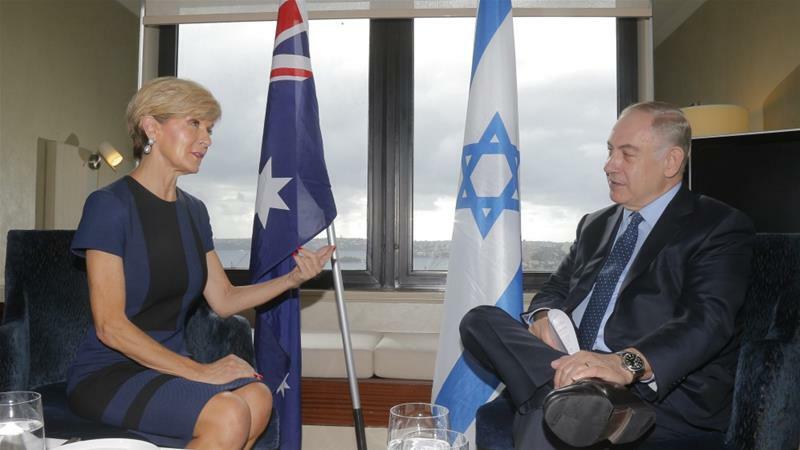 It makes no sense why Australia is in step with successive Israeli governments. Polling trends among the Australian public show a more responsible attitude to the Palestinian-Israeli issue than that adopted by Australian Labor and Liberal governments. Under a Labor government with Julia Gillard as prime minister in 2012, Australia refused to recognise a Palestinian state and this has been the position of the current Liberal government. The Labor opposition is still grappling with whether to adopt acceptance of statehood as a policy, and on the eve of Netanyahu’s visit, former Labor prime ministers, Bob Hawke and Kevin Rudd, and former Labor foreign minister Bob Carr have been actively calling for Australia (and the Labor Party) to recognise Palestine, and have sharply criticised Israel’s continued settlement expansion policy which they recognise is a violation of international law. The Australian government’s flirtation with Israeli demands has extended to a selective and dangerous approach to international law. Why is this the case? It can be described as an ideological attitude that permeates across other domestic policies. In June 2014, Australia found itself in the middle of a serious diplomatic crisis when Attorney General George Brandis, who despite being the first law officer in the country, with no expertise or knowledge in international law, refused to accept East Jerusalem as occupied. Australian Foreign Minister Julie Bishop agreed with Brandis saying the term was not helpful. Both Bishop and Brandis tried to defuse the policy shift as many Arab and Muslim majority countries threatened sanctions against long-standing trade links. Netanyahu at the time welcomed the change. Of course Bishop is well aware of the law and the international legal position and she would be advised to look further given Australia is a party to the Geneva Conventions. The Rome Statute of the International Criminal Court (ICC) recognises grave breaches of the Geneva Conventions as amounting to war crimes offences. To add to that, Australia has codified the Rome Statute offences into its criminal code. So such offences are also offences against the Australian Commonwealth. That the Australian government and foreign minister are openly championing a warped view of the settlement enterprise – advanced only by the extreme fringe of Israel’s supporters worldwide – that encourages disrespect for international law which Australia is duty-bound to respect, observe and ensure respect for globally. Netanyahu met with Bishop on the last day of his visit and expressed concerns about the prospect of prosecution in the ICC and sought Australia’s support in preventing investigations and an eventual prosecution for war crimes and crimes against humanity. Israel’s settlement enterprise is likely to be one of the issues that the ICC will focus on when, and if, a decision is made to open a formal investigation. Israel’s Channel 2 and the Jerusalem Post reported that Bishop apparently assured Netanyahu that Australia will be an “important player”, and committed to defending Israel in “hostile” international forums as it has done previously. Bishop’s assurance to Netanyahu runs contrary to the international community’s obligation to end impunity. The timing is important. Australia has just launched its bid in Geneva to claim a seat on the UN Human Rights Council. Australia’s own record and violation of international law and human rights is evident. The policy of indefinitely detaining some of the most vulnerable people, those people seeking asylum, in “offshore detention centres” on tiny remote islands in the Pacific, has been the subject of sharp criticism and condemnation. And, more recently, the conditions on Manus Island and in Nauru detention centres, have been alleged to amount to crimes against humanity in a recent communicationlodged with the ICC by leading international academics and practitioners. Australia’s xenophobic border protection policies have been viewed positively by the right-wing in Europe and President Trump. Australia’s inconsistent approach to international law and human rights doesn’t stop there, it has rejected calls for accountability for allegations of war crimes in Sri Lanka, and instead chosen to partner with the Sri Lankan government to enact its boat “turn back” policy . It is also silent on the oppression of the people of West Papua, and closer to home, has failed time and again, its indigenous people. Australia needs to chart a foreign policy which is guided by respect for international law. It should also adopt a policy independent of Israeli demands with a view to recognising the human rights of the Palestinian people and their right to seek justice and accountability. Rawan Arraf is a Palestinian-Australian human rights lawyer practising in the area of refugee protection.